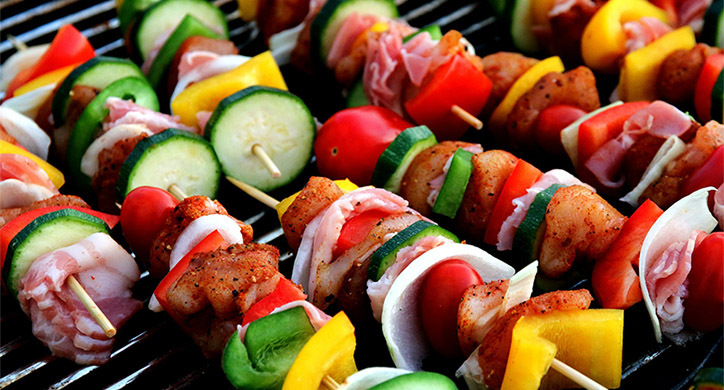 How Does the CDC Detect Foodborne Illnesses? The U.S. recently experienced a multi-state E. coli outbreak tied to romaine lettuce. 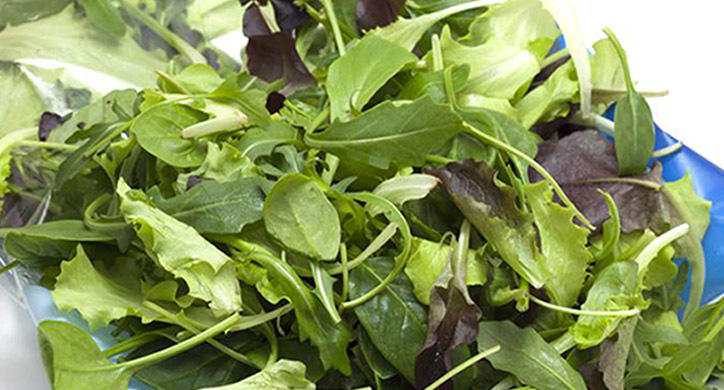 Five people died and hundreds became sick from eating the contaminated lettuce. Though the infected romaine is no longer for sale, consumers remain concerned. How does the CDC find the source of the outbreak to help keep us safe and regain consumer confidence? As of June 1, 2018, the E. coli O157: H7-contaminated romaine lettuce outbreak has caused 5 deaths, 89 hospitalizations, and 197 known illnesses in 35 states. Even though the contaminated romaine is no longer in our food supply, the impact will undoubtedly be felt for some time as consumers continue to be concerned about eating the lettuce. If you haven’t seen the headlines, you probably noticed the momentary disappearance of Caesar salads from restaurant menus and romaine lettuce from grocery store shelves when retail and food service companies around the country pulled products containing romaine lettuce from shelves in response to the foodborne illness outbreak linked to the consumption of contaminated romaine lettuce. 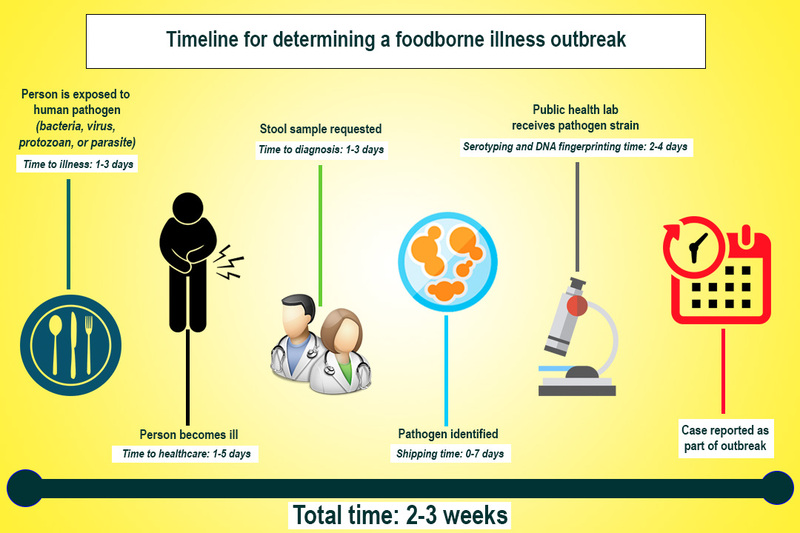 How do we determine when foodborne illness outbreaks occur? The Center for Disease Control (CDC) is the federal government agency responsible for determining when outbreaks occur, identifying the microorganism that caused the outbreak, and identifying the contaminated product. 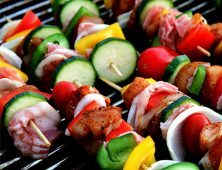 The CDC defines a foodborne illness outbreak as an illness where two or more people get sick from eating the same food in roughly the same timeframe. The CDC collaborates with the FDA and USDA in foodborne illness outbreak investigations, helping to identify what caused the outbreak and alerting the public when a source is identified. Have you ever been sick and wondered if it was a virus or something you ate? Unless your symptoms are very severe and/or have lasted longer than a few days, a visit to your doctor might result in being told to go home, get rest, and stay hydrated. Most often with this circumstance, you will not undergo any tests to determine what is causing your symptoms. What is not widely known is that the leading cause of foodborne illnesses recorded each year in the U.S. is norovirus. This virus causes more than 5.5 million illnesses and cost more than $2 billion in healthcare and lost productivity costs annually. It accounts for more than 58% of all foodborne illnesses where the agent is known. Norovirus can be transmitted person-to-person or indirectly from contaminated surfaces, food, and water. Most foodborne illnesses are detected when many people are eating their meals at the same place and around the same time. Prime examples are school and workplace cafeterias, social gatherings, and foodservice providers on cruise ships or at a resort. The CDC identified a foodborne illness outbreak — what’s next? Based on the pathogen detected, state health officials develop a questionnaire for the patients to gather very specific details of what, where, and when they ate the likely contaminated food. Of significant importance is the pathogen’s incubation period — the time from when someone consumes contaminated food until symptoms start. For example, an E. coli O157: H7-caused illness typically takes 3-4 days for symptoms to appear and commonly lasts 5-10 days in healthy adults. An incubation period like this one can be a challenge when patients are asked what they ate up to 10 days before arriving at their doctors’ offices. 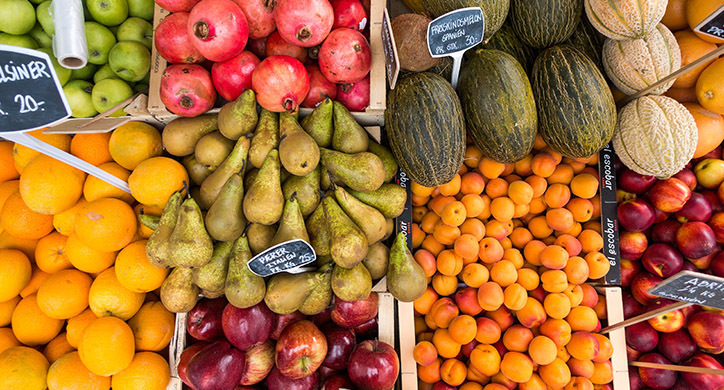 After the dietary data is gathered from reporting patients, the information is analyzed to find common foods that were eaten more often than expected based on the typical American diet. This can be a riddle. For example, those infected by the illness may have gotten sick after eating hamburgers at a picnic. But it may be unclear whether the burger, tomato, lettuce, onion, or the mayo was responsible. Without a clear determination, the CDC lists all potentially responsible ingredients in its PulseNet database as part of the outbreak data collection and investigation process. Of all the outbreaks studied in 2015, only 40% identified a specific food vehicle or cause. In about half of outbreaks where a food vehicle was identified, multiple food ingredients are typically involved and no particular ingredient has been pinpointed as the vehicle. In the romaine outbreak, public health officials determined that romaine was what made people sick after interviewing those who had become ill. More than 90% of interviewees reported eating romaine before getting sick. However, identifying exactly where that lettuce came from is a much more complicated process. Before lettuce reaches a restaurant or grocery store, it may pass through several other companies (e.g., distributors, brokers, etc.). When lettuce leaves the field, it is packed into cartons that contain detailed information about how, where, and when it was grown and harvested including the individual harvesting crew members who picked it. But restaurants and grocery stores buying lettuce from the produce industry typically throw the carton away and do not retain all that detailed information tracing product back to the farm and field. Only in one instance in this outbreak was the FDA able to identify a company that grew some of the contaminated romaine, and that was the prison in Alaska where eight prisoners got sick. But the implicated produce company has several farms in the desert growing region and product information retained by the prison and the distributor from which the prison bought the lettuce was not adequate to identify the field in which the lettuce was grown. In order to solve the mystery of how the lettuce became contaminated, investigators need to know which farm and fields the lettuce came from. Yes. In the current E. coli O157: H7 outbreak, the CDC stated that the identified food vehicle is romaine lettuce. As of early May, 112 people had been interviewed and of those people, 91% stated they ate romaine lettuce a week before becoming ill. Because romaine lettuce has a shelf-life of approximately 21 days and the last shipment of romaine from the desert-growing region was in mid-April, the CDC, state and local health departments and the industry have all confidently assured the public that romaine lettuce is safe to eat again. The answer lies in the seasonal production in lettuce-growing locations in the west. Arizona and California, the two largest lettuce-producing states in the U.S., grow lettuce in an annual production cycle: as northern California moves into winter around November, lettuce production shifts to the desert in Arizona. And when spring arrives in California, production moves back north in California as the desert becomes too warm to grow – usually in April. 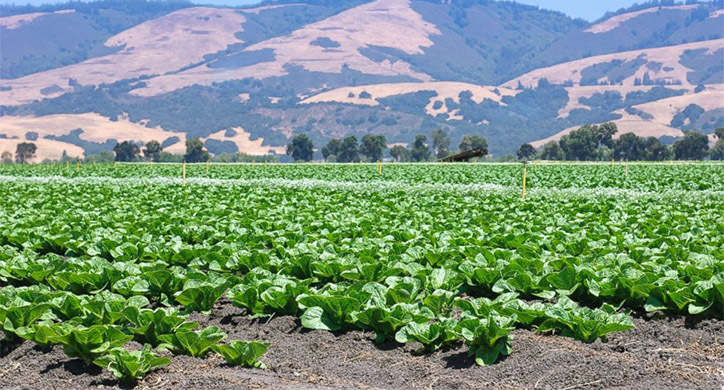 The CDC was thus able to isolate the general location of the affected romaine by following the annual production cycle. As we have discussed on Dirt-to-Dinner, seasonality shifts suppliers for U.S. produce. When the seasons change, your produce changes, too— and that also means when a growing season ends in one state it can begin in another. 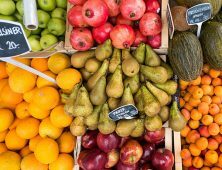 Despite the tragic consequences of this outbreak, the U.S. has one of the safest food systems in the world. It may be difficult to fathom, but the amount of food circulating in the U.S. on a daily basis is staggering. Our produce is grown by over 200,000 growers, supplemented by millions of other growers around the world. We typically consume this food three or more times a day in our homes or in more than 600,000 restaurants. Public health experts estimate that in our nation of 330 million people, 47.8 million people or 15% get sick, and 3,000 people or 0.0009% die annually in the U.S. from contaminated foods. The goal, of course, is to prevent any illnesses from occurring in the first place. Special thanks to Dirt-to-Dinner contributors Susan Leaman and Diane Wetherington of iFoods Decision Sciences. The CDC is the agency responsible for multi-state outbreaks of a foodborne illness. However, in the event you feel sickened by something you ate, the first step in this detection process is to visit your doctor, who then proceeds with the proper reporting protocol. 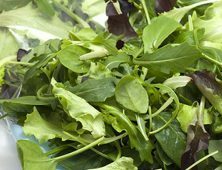 Determining the source of contamination is a complex equation involving many parties – growers, packers/processors, distributers and retail / food service operations, which is why, as of today, the source(s) of E. coli O157:H7 and how romaine lettuce became contaminated is still unclear.